Citizen volunteers play a critical role in supporting the city's mission to provide "Simply better service for a world-class community." Volunteer opportunities are offered year-round for coaching Scottsdale Bobcats Adaptive sports programs including swimming, golf, track & field, basketball, flag football and bowling. Those interested will work with individuals of all ages with a range of disabilities. Volunteer coaches will be required to commit for an entire 8-12 week season that includes once-a-week practices along with occasional weekends. In addition to practices, volunteers need to attend a pre-season disability awareness training, complete a series of online training sessions, attend two all-day competitions and join the team for an awards banquet. If this sounds like an opportunity that you may be interested in, please call or email us. Go Bobcats! Each fall and winter, the Adopt-A-Family Program helps families for Thanksgiving and the holiday season. We support up to 500 families or individuals to enjoy the Thanksgiving holiday with a holiday meal. We help match sponsors to families so they are able to have a special holiday. Help hand out food boxes and bags of toys. Litter-free streets and roadways are a point of pride for the community and a reflection of local citizens' dedication to their quality of life. Select Scottsdale streets and roads are available for adoption by those enrolling in the program or those wishing to clean on a one-time basis. A litter clean up makes a great community service project with a big impact! Free vests, gloves and bags are provided, as well as project tips. Age restrictions apply, please visit here for more information. Each fall and winter, the Adopt-A-Senior Program serves low income, homebound, isolated seniors in Scottsdale by matching generous donors who "adopt" eligible seniors and supply gifts from their "wish list". There are many ways to contribute besides "adopting" a senior. Each year the Back to School Program helps Scottsdale school kids return to school with pride! The Back to School Program provides backpacks, school supplies, clothing, underwear, socks and shoes for up to 1,000 school children. You can help children return to school with pride by volunteering and helping organize school supplies and clothing before the event, or distributing items to school children the day of the event. The City Council nominates candidates for vacant positions from the Scottsdale residents that apply to serve on the City's Board and Commissions. The Council relies on these citizen-based Boards and Commissions to research issues, listen to community input and recommend to the City Council policy direction on a variety of important city issues. Scottsdale residents can find information about the vacancies and functions of these boards and commissions on the city's website. We are looking for individuals to help open, sort, and prep a large volume of daily mail received within our Remittance Processing operations. This challenging opportunity offers volunteers a glimpse of the scale of operations needed to process payments submitted to the City and ability to work in a team environment. Volunteers are needed between the hours of 8:00 a.m. to 10:00 a.m., Monday - Friday, and asked to commit one day a week for a period of 12 weeks. Our office is located on the southeast corner of Indian School Road and Civic Center Blvd. The Vista One Stop Career Center provides job development services for job seekers. Volunteers help individuals on a walk-in basis by providing assistance to job seekers with diverse skills and backgrounds and a variety of needs. Volunteers also maintain statistics, prepare data entry updates and reports, provide career guidance, and assist with the use of computers. Are you looking to serve the community? Are you people oriented? The Scottsdale City Court is looking for you. We are currently looking for volunteers to assist the court customers at our information windows. As a custodian of the court, you will be the first interaction with court customers at the information windows. Duties will include assisting and directing court customers to courtrooms, customer service windows, self-service center, Human Services office, and the MVD kiosk as needed. Processing outgoing mail for various court departments; including folding and stuffing envelopes. Assisting with jury preparation on jury call days; setting up refreshments and prepping jury clipboards. Court volunteers must be minimum age of 18 yrs and are asked to fulfill a 4-hour shift with time slots available between 8:00 a.m. to 12:00 p.m. or 1:00 p.m. to 5:00 pm. Are you people oriented? Excited about Downtown Scottsdale? Interested in sharing your excitement and knowledge with visitors who are new to the Downtown? 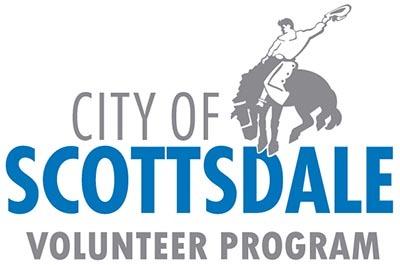 Then consider volunteering as a Downtown Scottsdale Ambassador. Ambassador volunteers are asked to fulfill a 3-hour shifts at one of two information sidewalk carts, with time slots available between 10:00 a.m. to 1:00 p.m. or 1:00 p.m. to 4:00 p.m. During your shift, you will have the opportunity to interact with visitors to the Downtown area providing information on various restaurants, sites to visit and shopping venues. Scottsdale Fire Department volunteers work directly with the public teaching residents how to become LifeSavers, prepare for emergency situations and reduce fall risk among seniors. Volunteers also work at our Headquarters taking care of administrative and customer service assignments. CURRENTLY RECRUITING: Volunteers for Home Safe Home, Lock-boxes for Seniors and Smoke Alarm Programs. The Vista del Camino food bank is licensed by Maricopa County Health Services. The food bank serves individuals and families, who live in Scottsdale and who are having difficulty meeting their food needs. Volunteers accept and sort donations, make food boxes, and assist with daily operations of the Food Bank. The library is an exciting place to work with many opportunities available between our five locations. We have volunteer jobs for those who like to work with people such as assisting or conducting story times, working in our Library Shops, providing triage customer service, doing outreach, assisting customers with computer questions and teaching computer classes. We also have a variety of jobs for those who like to be more behind the scenes such as checking in materials, organizing and shelving books, pulling customer holds and merchandising our library. Mediators assist with simple neighbor-to-neighbor issues by allowing two parties to come together in a safe environment and helping them to come to an agreed-upon resolution. The mediators do not make any decisions but are a facilitator of dialogue. The City of Scottsdale partners with the private, non-profit organization McDowell Sonoran Conservancy that provides stewards for the preserve, educational programs & hikes. For more information on the McDowell Sonoran Conservancy visit: www.mcdowellsonoran.org . Volunteer opportunities in the McDowell Sonoran Preserve cover a wide of activities – almost all of which are outdoors in the Preserve itself. Projects such as cactus salvage and revegetation, mitigation of damaged or scarred areas within the Preserve, trail maintenance and sometimes minor trail construction, trash and litter pick-up and removal, invasive weed removal, natural habitat improvement, sign and fence installation, to name a few of the categories. Projects are completed in groups, most of which are trained, experienced Preserve volunteers. Preserve staff provide all tools, materials and training to do the work – we just ask that you bring a good pair of work gloves, a water bottle (we have water for refills) and good, sturdy, closed toed shoes or hiking boots. Dress appropriate to weather conditions and work assignment. This program provides assistance to qualifying homeowners or tenants who are physically or financially unable to maintain their properties. Operation Fix It teams volunteers and local businesses to provide labor and materials. Interested in giving back to the community? There are several volunteer opportunities for those interested in working in a parks and recreation environment. Opportunities include volunteering for one-time special events at city parks and other locations throughout the city, in addition to various park maintenance projects! For additional information please email or call. Do you like to hike, meet people, spend time outdoors, enjoy the Sonoran Desert and share your knowledge of our unique and special environment? If you answered yes to any of these questions, Pinnacle Peak Park has a variety of volunteer opportunities available to you! Training begins in October and includes classroom time on the subjects of local geology, flora, fauna, history and archaeology of the area. Police volunteers work within several divisions of the department in clerical support positions and assist patrol in vehicle transport. Volunteers must be citizen academy graduates before being eligible for any positions that may be available. Citizen academy applications can be located in the Police section of the website and two sessions are held each year. Volunteer applications are only accepted if a position is available and any and all openings are posted on the Police website. Scottsdale Senior Services provides an integrated system of services, resources and opportunities to help people improve their lives, neighborhoods and community through recreation, social services, and health and wellness services. Both Scottsdale Senior Centers, Via Linda Senior Center and Granite Reef Senior Center, offer various volunteer opportunities for you to make a difference. Some examples include concierge, blood pressure screeners, intergenerational programs, home delivered meals, lunch program, computer lab, peer support program, and special events. Special events host several events throughout the year including Fall Festival, Mighty Mud Mania, Family Fun Nights, and Paws in the park. The events usually take place on Saturday evenings and are located in parks thorough the City. Volunteers help in multiple areas including surveys, game booths, line attendants, and general event support. Volunteers are needed for the day of event support. The Volunteer Sign Removal Program utilized volunteers in the removal of illegal right-of-way signs. The Youth Corps is a summer a volunteer program for teens, 13-17 years old. Volunteers can explore career opportunities, give back to the community, and receive school credit (with prior school approval). Applications will be available starting March 11 and will close April 17th.